The magician unfolds a two bareness board, so long as two boards overlapping & pulled slightly, since changes a cup, what is more surprised is since may change continuously 6 cups. One cup, two cups, three....six cups continuously come out from two plates. Comes complete with instruction sheet. 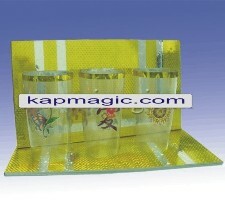 3 Glass Production plates also available.